With over 5 million followers on Instagram, Beyonce’s personal posts are some of the ogled and liked on androids across America. If her hubby Jay Z and her first born Blue Ivy aren’t actually in the picture, she loves making references to their family dynamic, often with a kind of The Story of The Three Bears effect (but minus that mischievous Goldilocks). She especially makes Blue inclusions which her fans adore, whether it her own old Hollywood arm folded arm chair next to Mommy’s, or mini Tom Ford shoes tom match her wrap-around stilettos, because every baby needs a pair of hot pink Fords for their little piggies. 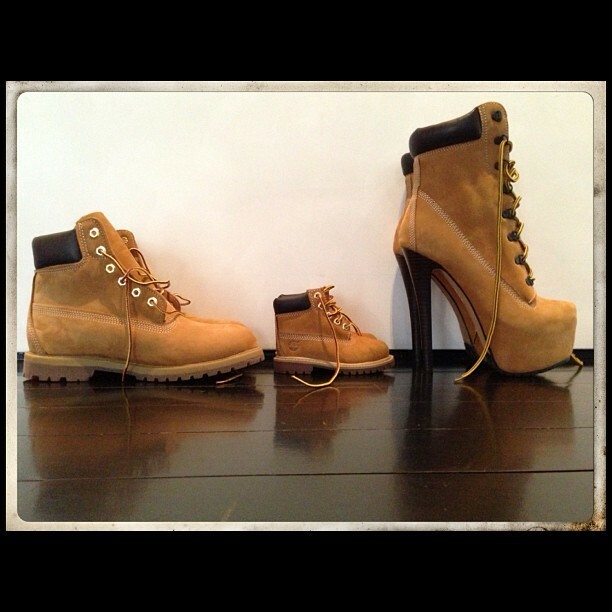 This time, she included Jay in a match-up of family’s Timberlands, an adorable pic that easily displays everyone familial role. You might remember Bey wearing a similar pair of her shoes in the video for her and Hov’s “’03 Bonnie & Clyde”.